The Dynagrip is an all-Cabretta leather glove from MG Golf that is a favorite of many players in the PGA Tour events. Cabretta leather gives it a buttery-soft feel, and it is also very durable. This golf glove comes in a traditional design and with some perforations in the fingers for breathability. It utilizes Velcro closure for a comfortable and hand-hugging fit, and it is only available in an all white color. Also, you can get it in all the six main sizes for adult golfers. Material: It is an all-Cabretta leather glove, and the company chooses the material keenly to ensure that each glove maintains a buttery-soft feel and is also very durable. Design: MG produces this glove in a traditional style which is what most golfers seem to prefer. The fingers have some perforations to enhance breathability and air circulation so as to keep the hand dry at all times. Closure: It has a Velcro closure that ensures that you always get a hand-hugging fit and it is also very useful in ensuring that the glove does not slip when you are holding a golf club. Color and Size: This glove comes in an all white shade but with some different colors on the company logo and it is available in six different sizes for adults and up to fourteen sizes if you include the ones for youth players. The all-Cabretta leather makes it a very durable golf glove. It has a buttery-soft feel. The all white and traditional look without any graphics is very adorable. This glove features a detailed stitching that gives it a tailored appearance. The leather material is moisture resistant, and it works with perforations on the glove to keep your hand dry and fresh. It is still an affordable glove despite the high-quality material and construction. You always get a hand-hugging fit thanks to the Velcro closure. They are available for both right and left-hand golfers. The Velcro closure is helpful when it comes to closure, but it looks cheap and will not last for long. It has a bright white color which makes it prone to staining, and it will also show dirt. The perforations on the fingers are still not enough for venting the clove, and so it can get hot during the summer heat. MG Golf is famous for manufacturing high-quality gloves, and some of them including this all-Cabretta leather one are what some of the PGA Tour winners wear. And so the brand alone is enough to convince you that this is an outstanding product even before you get to use it. The manufacturer uses all-Cabretta leather in its construction to ensure durability, and the company maintains a traditional golf glove design and detailed stitching. 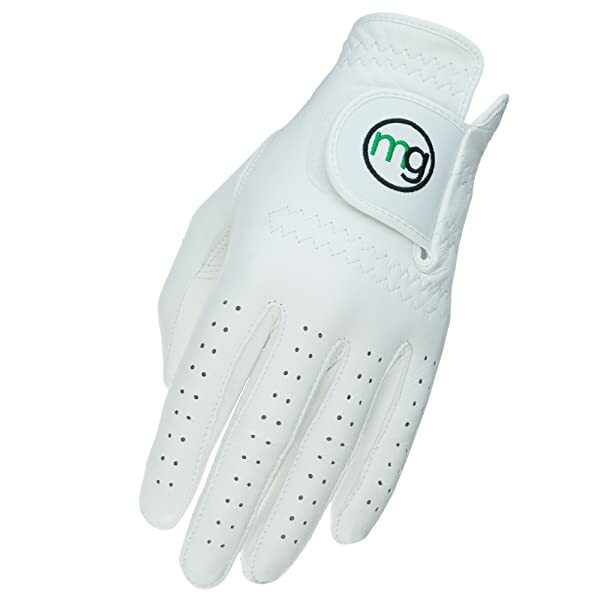 Golfers also seem to love the perforations on the fingers as they help to keep their hands dry when playing and the Velcro closure is also an excellent addition as it prevents the glove from slipping and also ensures that golfers always get a custom fit. Although there are a few complaints about the glove such as the Velcro looking cheap and the fact that it is only available in a white shade the bottom line is that it is a best golf glove that you will enjoy using.